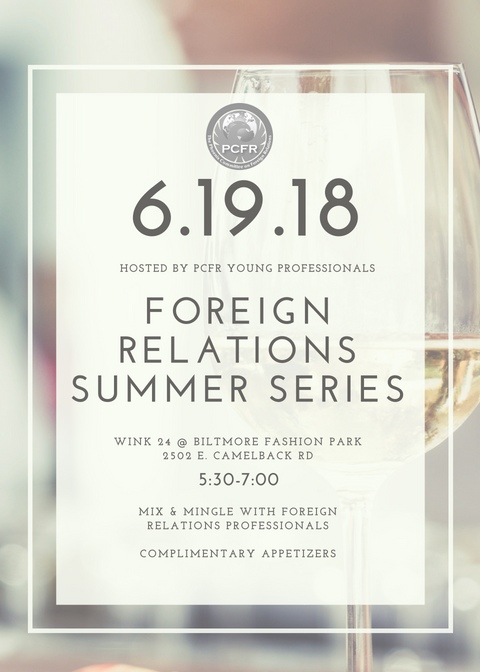 The Phoenix Committee on Foreign Relations Young Professionals (PCFR YP) invites you to our Foreign Relations Summer Series on Tuesday, June 19 at 5:30 pm at Wink 24. Whether you work in the international field or have an interest in foreign affairs, come meet like-minded professionals and learn about the Phoenix Committee on Foreign Relations. Appetizers will be provided alongside a cash bar. RSVP by Noon on Monday June,18 2018. See you there!